Wind Park in the Haze, originally uploaded by m.prinke. 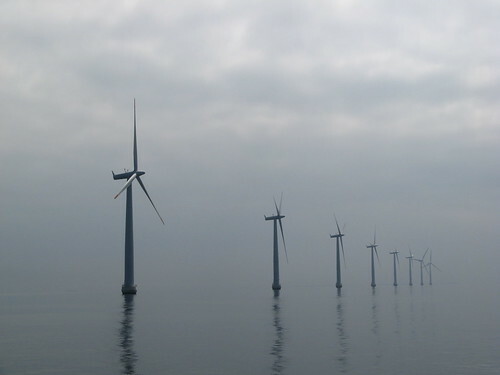 Thanks to Jack, we got wind of an great article in The New Yorker about a little Danish island called Samsø with huge environmental ambitions. We knew about the island, of course - in Denmark, Samsø is where the best potatoes come from - and we knew about their eco-goals. But here's an article that explains it in great detail. It's a lovely island [and that's saying something when you have 450 or so of them] and the 4300 islanders decided a decade or so ago to become the world's first carbon-neutral island. Thanks to Corey for letting us know about a CBC radio programme called Quirks and Quarks that featured a bit on Samsø. You can hear the broadcast at the website. 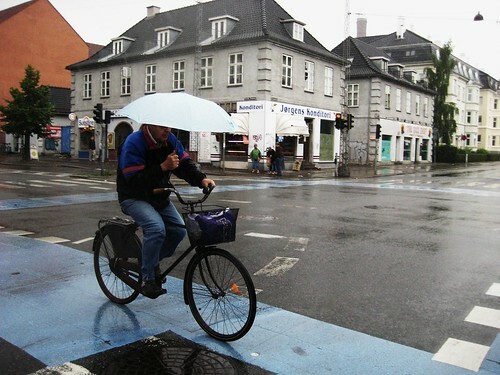 Nothing to do with Samsø... just a cool photo of a Copenhagener in the summer rain.